Suga Cookie How You Get So Fly? Sometimes, I like to branch out and do something wild and crazy like bake something that doesn’t involve chocolate (Full disclosure: In case you haven’t noticed, I’m a chocolate fiend. If I only baked for myself, it would be all chocolate all the time). 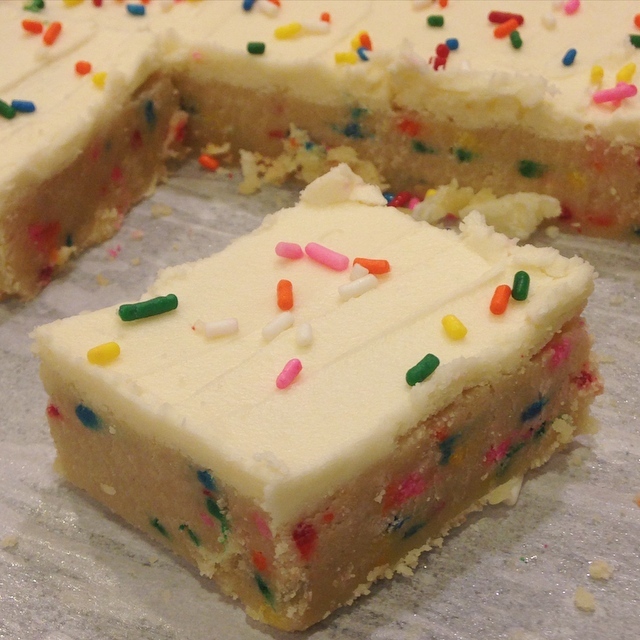 Fortunately for my family and friends (and my health), I like to bake for the common good and a few weeks ago that resulted in these admittedly delicious Funfetti Sugar Cookie Bars by Lauren’s Latest. They basically consist of sugar, topped with sugar, and decorated with rainbow sugar. One of the things I love about this recipe is that it takes a classic dessert and puts it in bar form, so it’s great to serve at events where people might have their hands full with let’s say…. red cups. A really valuable thing I’ve learned after baking for so many parties is that people who are standing around with beverages are much more likely to eat something that is mess-free and does not require a plate, fork, or even a napkin. That makes any kind of brownies, bars, cookies, or bite size treats ideal. 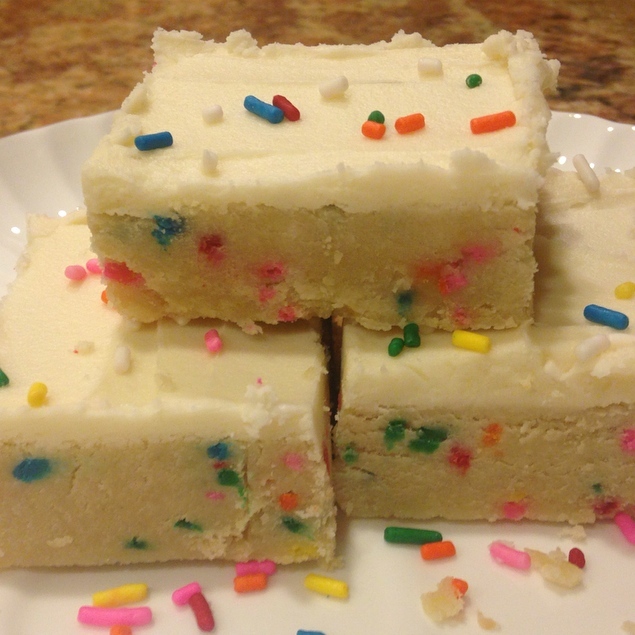 I made these Funfetti Sugar Cookie Bars for a friend’s birthday a few weeks ago, wrote happy birthday on it in frosting, and it was a smashing success. Also, these bars are VERY easy to make and can be made even easier and in less time if you use store-bought frosting (but, don’t). 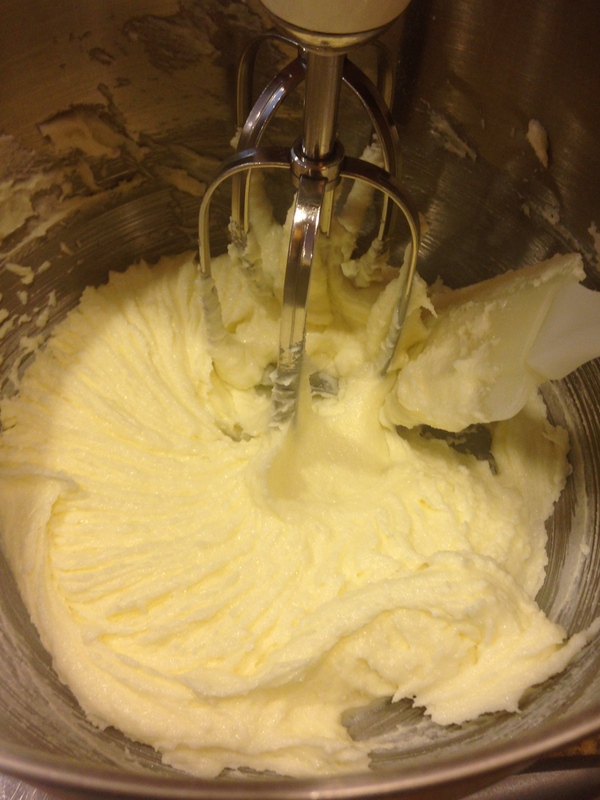 To begin, combine butter and sugar in a large bowl until light and fluffy. 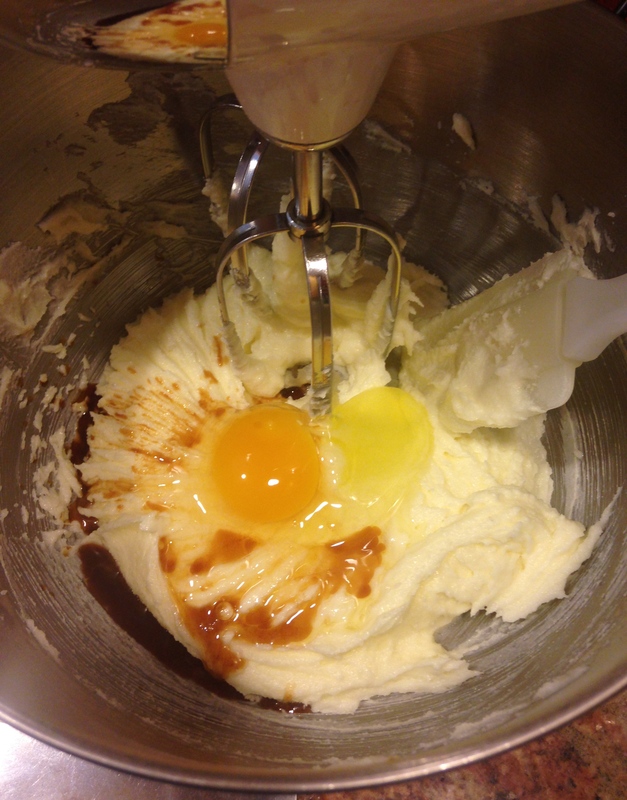 Then mix in the egg and vanilla until well combined. Then spread the dough evenly in a prepared 9×13″ dish and bake for 20-25 minutes or until the edges are golden brown. This baked perfectly for me in about 24 minutes and it was really easy to tell when it was done. Once it has cooled completely, you either make this ridiculously amazing buttercream frosting (highly recommended) or pop open a can, and frost away. Decorate with sprinkles or colored frosting! Preheat oven to 350 degrees. Line 9×13 baking dish with parchment paper and spray lightly with nonstick cooking spray. In a large bowl, mix butter and sugar on low speed until combined and then mix on medium-high speed for another 3 minutes until light and fluffy. Mix in egg and vanilla on medium-high until well combined. Mix in flour, baking powder, and salt on low-medium speed until just incorporated. 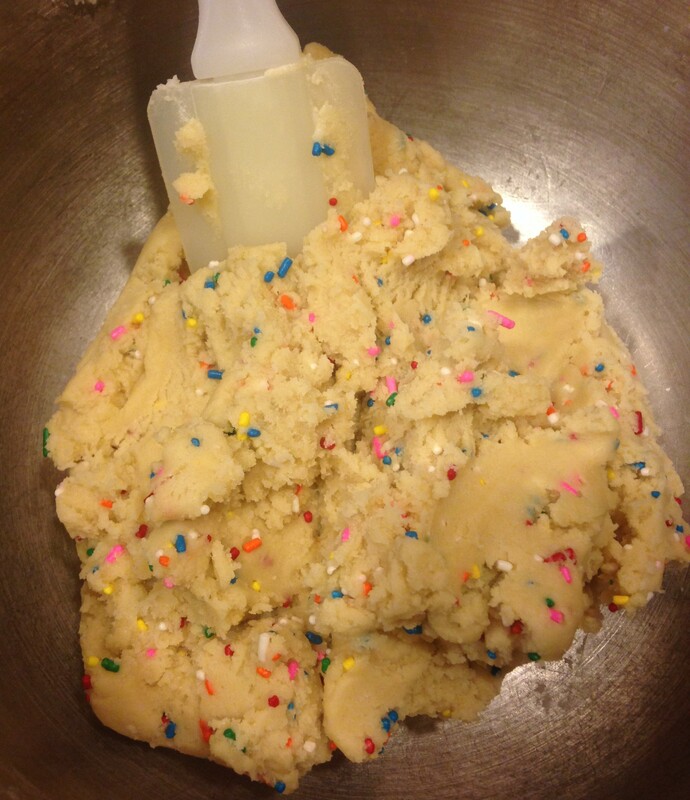 Using a spoon or spatula, mix in sprinkles. 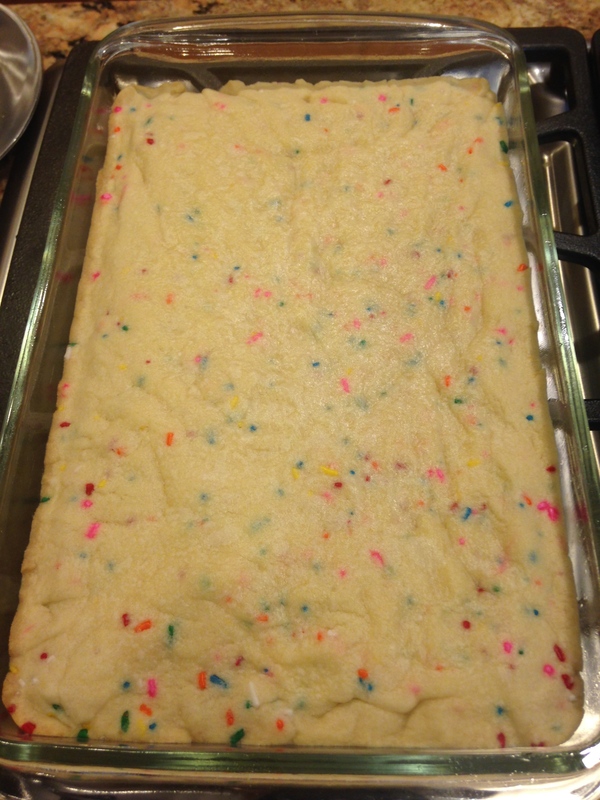 Spread dough evenly in prepared baking dish. Bake for 20-25 minutes, or until edges are golden brown. The center will look slightly undercooked. Frost with your frosting of choice, or with half a batch of my favorite Vanilla Buttercream Frosting. 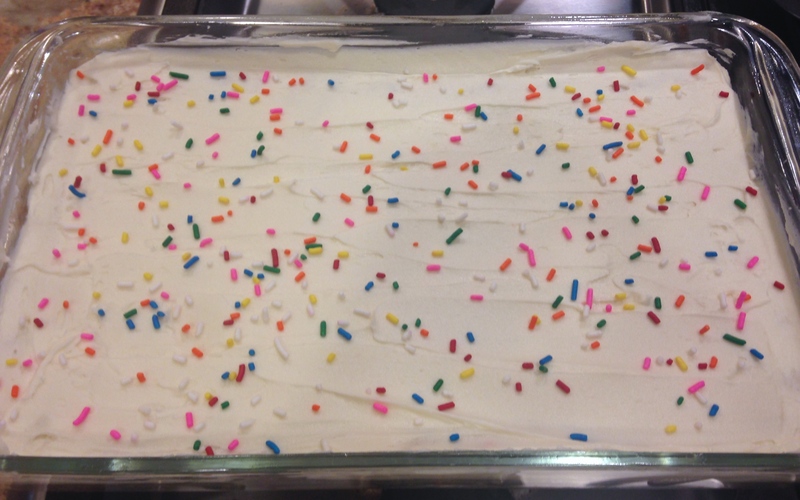 Decorate with additional sprinkles on top. Delicious recipe! And your blog name is awesome sauce! Thank you so much! And I love your blog title as well!